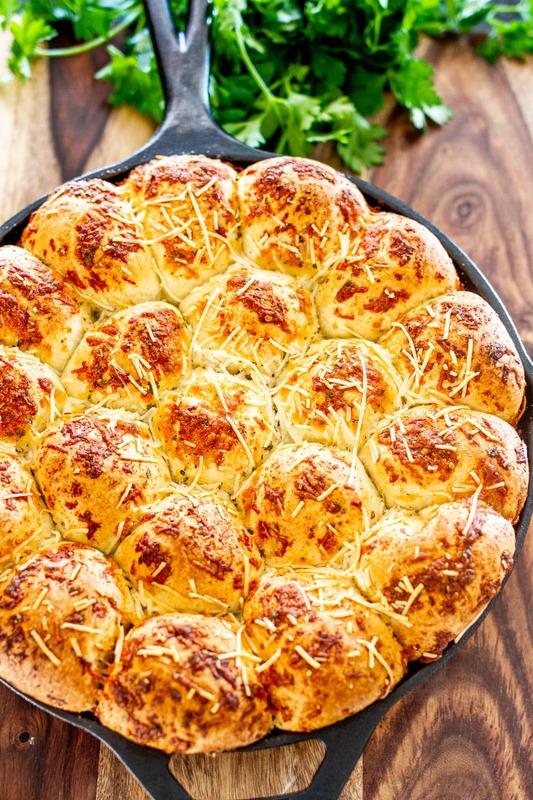 This Italian Skillet Pull Apart Bread is incredibly easy to make using frozen bread rolls, rolled in an Italian herbed melted butter and sprinkled with cheese. Only 4 ingredients, a lot of fun to make, more fun to eat and so delicious! My dear readers, through this blog I aim to bring to you a variety of different recipes and not get stuck on certain things. That’s just not who I am. So today I bring to you these skillet baked rolls buttered and seasoned with Italian seasoning. Because butter is what makes the world go round and round. No, seriously. It does. But look at that butter, its vibrant color. Don’t you just want to slather it all over your face. I’m telling you, goodbye wrinkles. Who needs Botox? If that wasn’t enough, I threw in some Pecorino Romano cheese. I cheated a bit here because I used frozen bread rolls. Don’t hate me, I have many recipes here to make your own bread rolls, but this time I cheated. I’m not perfect! You don’t have to be either. That’s what makes these rolls so great. They’re super fast to make and you will still be the heroine (or hero) in the kitchen. The kitchen will smell like freshly baked bread and those herbs, oh those herbs. 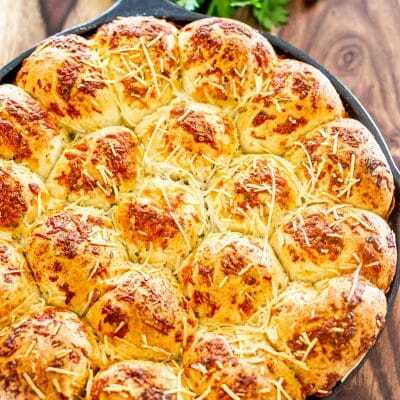 Frozen dinner rolls – this recipe was made for frozen dinner rolls, so why mess with a good thing. However, if you want to make fresh rolls, use this recipe here. Butter – I prefer to use unsalted butter so I can control the sodium level in my food, but use whatever you have in your fridge. 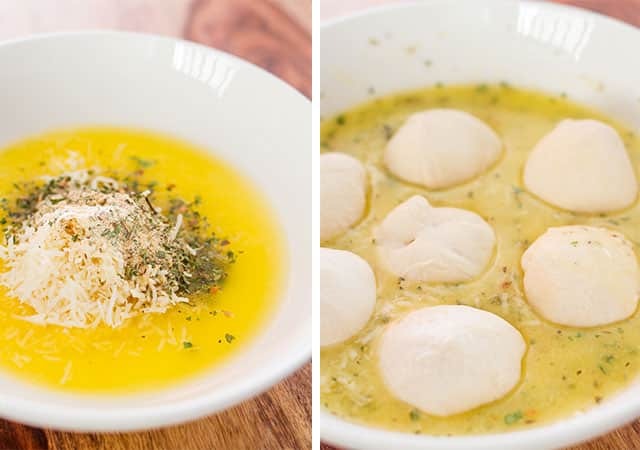 Italian seasoning – you won’t want to skip this ingredient. Pecorino Romano cheese – I love using freshly grated Pecorino Romano cheese, but you can use just Parmesan cheese, or even Gouda! These rolls are extremely easy to make. For this part you you might have to throw everyone out of the kitchen, or else they might want to take this butter, bottle it and sell it. You take some melted butter, throw in some Italian seasoning, a bit of Pecorino Romano cheese, whisk it all together and voila! You’ve got herbed cheesy butter, or Italian herbed butter, not sure what to call it, but who cares. It’s MONEY! Take the frozen rolls and dip them in that yummy butter and lay them nicely in a skillet. Then just because that’s how we roll, take some more Pecorino Romano cheese and sprinkle some over them rolls. Cover them up with a clean towel and let them rise and they will take over the skillet and show you how much they love you. Bake for about 20 minutes or until golden brown in a preheated 400 F degree oven. 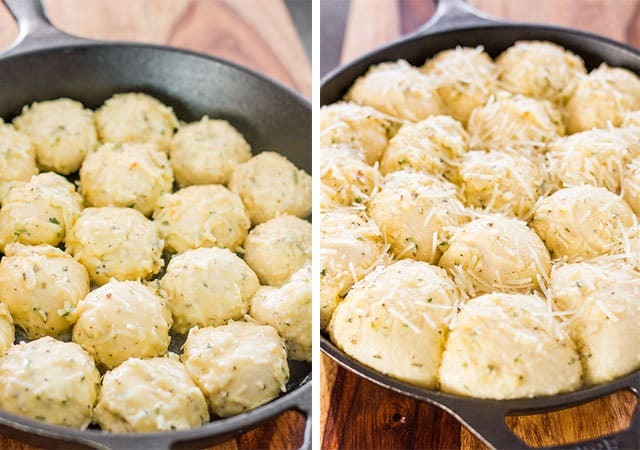 After you bake them, you end up with this skillet full of these delicious rolls, they’re buttery, cheesy, so tasty and all you do is pull one out and enjoy. I dare you to stop at just one, seriously, try it. You can keep them right in the skillet and just wrap the rolls with plastic wrap, then refrigerate. When serving again, you can place the skillet directly in the oven for a few more minutes to heat them through. These are great to make ahead, especially since we’re using frozen rolls. So prepare them as you would then wrap the skillet tightly with plastic wrap and refrigerate until next day when ready to bake them and serve. You can even freeze them like that for up to a month. love what you see?Follow @jocooks on Pinterest! In a shallow plate, whisk the butter together with Italian seasoning and 1/2 cup of the Pecorino Romano cheese. Take each frozen bread roll and roll in the butter, then place it in a 12 inch skillet. Repeat and make sure there is some space between the rolls, so they can rise. Sprinkle with remaining Pecorino Romano cheese. Cover with a clean kitchen towel and let the rolls rise in a warm, draft free place for about 1 to 2 hours, until doubled in size. Preheat oven to 400 F degrees. Bake for about 20 minutes or until golden brown. Leftovers: You can keep them right in the skillet and just wrap the rolls with plastic wrap, then refrigerate. When serving again, you can place the skillet directly in the oven for a few more minutes to heat them through. Make ahead: These are great to make ahead, especially since we’re using frozen rolls. So prepare them as you would then wrap the skillet tightly with plastic wrap and refrigerate until next day when ready to bake them and serve. You can even freeze them like that for up to a month. Nutrition: Please keep in mind that nutritional information is a rough estimate and can vary greatly based on products used. tried this recipe? rate it belowtag @jocooks on instagram and hashtag it #jocooks! DON'T FORGET TO SUBSCRIBE TO JOCOOKS NEWSLETTER FOR FREE AND RECEIVE ALL NEW RECIPE NOTIFICATIONS DELIVERED RIGHT INTO YOUR INBOX. PLUS YOU'LL GET A FREE EBOOK!! Disclosure: This post may contain affiliate links. 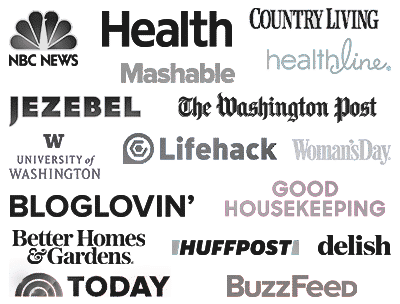 I may earn a small commission for my endorsement, recommendation, testimonial, and/or link to any products or services from this website. Your purchase helps support my work and helps in maintaining this blog, while at no extra cost to you. Could this be cooked at 350 instead of 400? 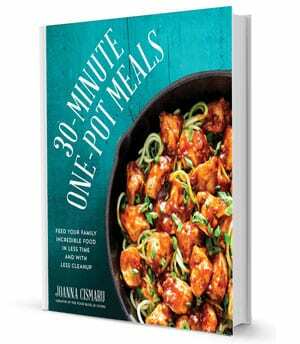 I’d like to make this at the same time as your Italian Shrimp Bake recipe. They have similar cooking times but different temps and I would love to cook them simultaneously and pull everything out hot. Do you think it would work if I put these in at 350 but on the top rack? And would it help if I thawed them first? I think you’d actually be better off cooking the shrimp bake at 400 for 10 minutes! Bread is a bit more finicky. They look amazing. Will try tomorrow. Thanks. Cant wait for you to try it and let us know. No I didn’t, it probably looks like that because they’re smothered in butter. I’m was going to make these for company but I’m a little short on time and will only be home for an hour to let them rise. Do you recommend letting them rise all day while at work or do you think an hour will be enough? Thanks – I can’t wait to try these! An hour should be more than enough. preheat oven 400 – so it heats for the time to prep rolls and then 2 hours? preheat should be after the rolls were doubled in size. You’re right, you don’t need to reheat the oven until the rolls have doubled in size. Instructions have been updated. I want to half the recipe, ingredient halfing is fine , what size skillet please? 6 inch?? I think a 6 inch would be too small, if you have a 10 inch that should be fine. do you thaw the rolls before dipping? These were really good, I will make again and again. Thank you for posting. Jo, you are awesome at this bread stuff 🙂 And I don’t care how “cheato” it might be… I’m in! I also bake tons of my own from-scratch breads, but love some Rhodes when company comes calling and I’m short on time! This is a recipe perfect for those occasions, and people will love it! 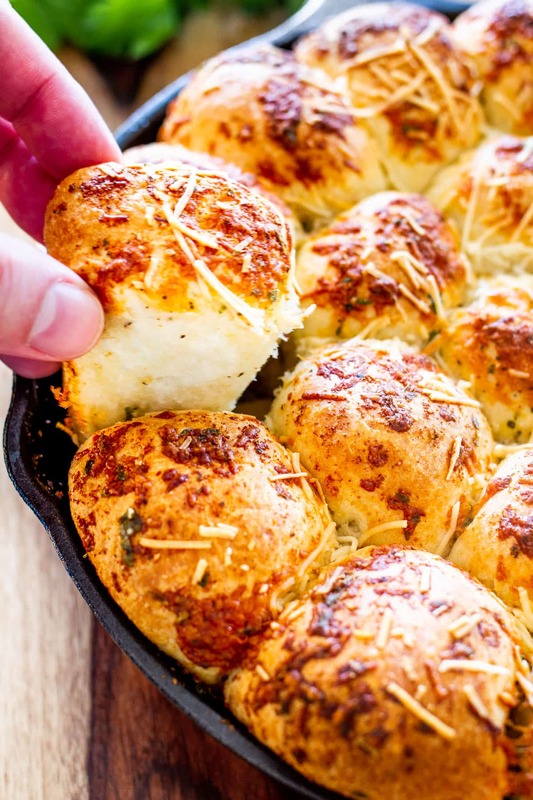 A pull-apart bread in a skillet?! totally a recipe I need to try.. it looks so delicious and all that cheese has got my mouth watering. What brand of Frozen Rolls did you use? Thanks, Having a Christmas Dinner/Get Together with Friends and thought these would be perfect to have with the Caesar Salad. I’ve GOT to try these. They look amazing. I made these last night for supper and they were delicious. I am glad you posted this recipe. photos. Gad—you are soooooo bad—bad—bad. Irresistible totally. Yeah I know! You gotta try them though! I'm Joanna (Jo for short) and this is my blog where I share with you my culinary adventures. Here you will find a variety of recipes using simple everyday ingredients and creating wonderful, delicious and comforting meals, including some decadent desserts.